Joyful foods made with whole, plant-based, organic ingredients. Let me tell you about Let Thy Foods. I dont know how they do it but they’ve jam packed these jars of joy with so much flavor. I add them to any simple recipe and boom, it’s flavor city. I’ve tried 2 out of the 4 flavors and I am completely hooked. 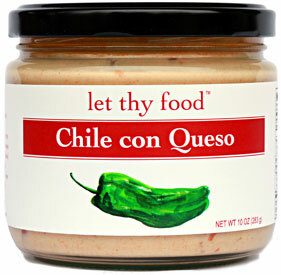 The Spinach Artichoke Dip & Chile con Queso are both items that I should always have on deck in my pantry. These two have worked so perfectly in so many of my quick dishes and instantly transformed them into fancy foods. They are oh so delicious and versatile too. I’ve used them on pizza, pasta, sandwiches, nachos, wraps, I think I even dipped an entire stalk of celery into a jar once and it was such a treat! But the awesome taste isn’t even the best part. Let Thy Food products are a 100% plant based, All Natural, Non-GMO, mostly Organic, practically homemade goodness using only the best ingredients. You wont find any icky chemicals or preservatives here. Products that taste so decadent AND are actually good for you are really hard to come by and that’s the real reason I LOVE LET THY FOOD. Plain and simple, I just cant live without them.